This week I thought I’d switch things up a bit and so I have created an outfit post with a bit of a twist, enter the video. I often find it difficult to do outfits justice with photographs because I think they are as much about how the clothes look, as how they fit & how they flow when you move in them. And, without stating the obvious, you just can’t show the flow of the clothes with a humble snap! I have been really loving the seemingly upcoming trend of OOTD videos and thought I’d give it a go to try and give you a better sense of the clothes I am showing you. So, here we go with our first outfit video – lights, camera, action! You didn’t think I’d JUST give you a video, did you? Here are a few stills too, for those of you who still aren’t too sure where you stand with the whole moving picture scene. I’d love to know what you think, so be sure to leave a comment down below! This blazer from H&M is lightly checked, double breasted and even has shoulder pads. I love the structured, smart look it gives any outfit it is paired with and it has been my go-to to throw on when the weather isn’t quite as sunny as it should be in June. I love how it looks with my adidas Gazelles, because I think it has a slight pink undertone. And we all know how I feel about a bit of pink! Underneath my blazer, I went for this delicate lace top, which I picked up a few years ago now from a charity shop & haven’t really taken it off since then. Well, I have because I’m not gross, but what I’m trying to say is that I LOVE it and that it is such a staple in my wardrobe. Paired with these black, smart trousers from Next, I think we are onto a winner of a monochrome outfit base! 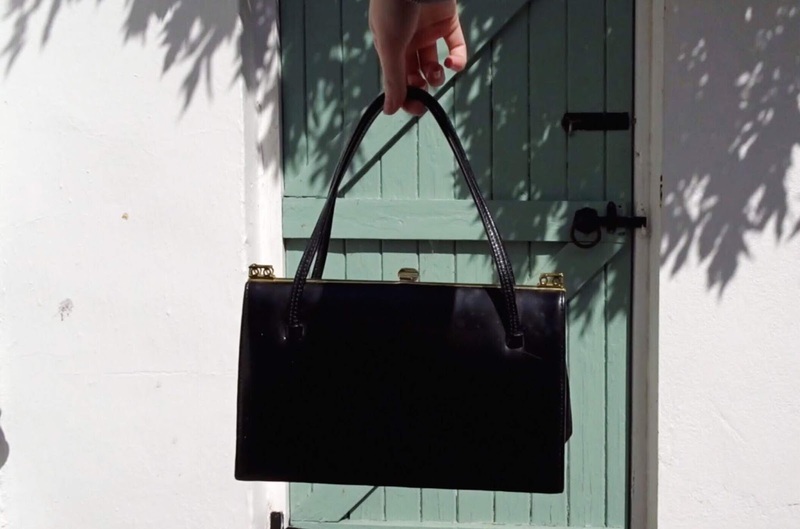 Sticking with charity shop finds, I decided that when I was choosing accessories for this outfit I needed to go for something simple & chic – in steps my charity shop ‘granny handbag’. I bought this when I was visiting a friend in Lancaster recently and is just such a timeless shape and I think the gold detailing just makes it. For three pounds how could I say no? It is the perfect bag to go with a smart outfit. You can also find this blouse in this post, these trousers in this post, this blazer in this post, and these trainers in basically every post ever. Maybe I’m not doing blogging right, but who said bloggers only get to wear things once? I am such an outfit repeater!